﻿ Trump Just Went Off On Jim Acosta Who Refused To Hand Mic To Female Staffer(VIDEO)!!! Trump just went off on Jim Acosta who refused to hand mic to female staffer. 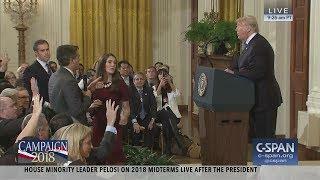 Acosta refused to give up the microphone after asking the president multiple questions and being told to sit down. A female White House staffer even attempted to pry the microphone away from Acosta, but he held onto it. The action drew Trump’s ire and the president went on a tirade about CNN and Acosta. 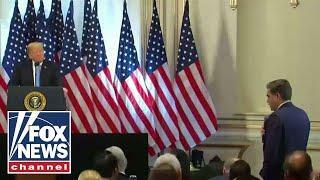 ✅The tense relationship between CNN’s Jim Acosta and President Donald Trump reached a new level in the president’s news conference after the 2018 midterms. ✅CNN's Jim Acosta has press pass suspended by White House.